Earlier this month, Kobelco Cranes unveiled an impressive new crawler crane in their hometown of Houston. 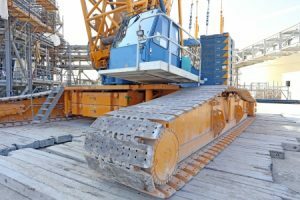 The CK 3300G-2 crane, which was developed in three variants for the company’s American and overseas markets, is now the largest model in Kobelco’s multi-purpose crawler crane series. Company officials say this crane should look pretty familiar to operators who have worked with other Kobelco cranes in the past, although the CK 3300G-2 does feature a new engine made by Swedish vehicle manufacturer Scania. Notable features of the CK 3300G-2 crane include an undercarriage that has been optimized for rough terrain, a working range limiter to help prevent collisions and an operator-friendly cabin with a tilting mechanism and extra-wide windows. The standard crane has a maximum lifting capacity of 330 U.S. tons, while a super heavy lift configuration offers an increased capacity of 385 U.S. tons. The CK 3300G-2 is also available with several different lifting attachments including a heavy fixed jib and luffing jib. To learn more about the newest addition to Kobelco’s crawler crane lineup, you can view the complete spec sheet on the company’s website. This entry was posted in Uncategorized and tagged Crawler Cranes, Houston, Kobelco. Bookmark the permalink.